As we heard at the first presidential debate last week, Donald Trump is among the legions of wealthy investors and transnational corporations that lobby for special tax breaks and then declare they have “broken no laws.” Meanwhile, the bottom 99 percent of taxpayers and small-business owners are left to pick up the tab. We now have a tax system where billionaires and global corporations such as General Electric and Boeing pay little or nothing toward the infrastructure, defense, national parks, and education. From the offshore tax havens, such as those disclosed by the Panama Papers, to complex trusts, loopholes, and a myriad of energy industry and real-estate tax breaks, the current rules benefit the already-haves. The United States effectively has a two-tier federal tax system with one set of rules for the wealthy and another set for everyone else. The vast majority of people and small businesses pay taxes on wage income that is often withheld in advance. But the greater one’s income and wealth, the more opportunities there are to reclassify income and dodge taxes. Trump declared his tax minimization makes him “smart.” In reality Trump is no genius, but he is rich enough to hire professionals in the wealth defense industry. Wealthy individuals like Trump deploy an army of trust lawyers, estate tax planners, charity advisers, accountants, specialty bankers, and tax attorneys (some of whom previously worked for the IRS), to slide past tax rules and create barriers to transparency, accountability and taxation. In a three-page 1995 tax return obtained by The New York Times, Trump reported a $916 million loss on his business ventures. This net operating loss, which could be spread over the previous two years and subsequent 15 years, probably eliminated all his income-tax obligations in those years, according to David Cay Johnston, who won the Pulitzer Prize for his tax reporting at The New York Times, and prominent tax experts Edward Kleinbard of the University of Southern California and Martin J. McMahon Jr. of the University of Florida. Without more information, tax analysts cannot determine if these were legitimate losses or fabrications. Trump should disclose his complete tax returns if he has nothing to hide on this front. Regular taxpayers may see their incomes spike and plummet, but are not allowed to carry forward a bad year against 18 years of future taxes. There may be a sound policy rationale for retaining net operating losses in real-estate tax law. But it remains another striking example of a two-tier tax system where wealthy individuals structure their financial affairs to take advantage of generous tax breaks that ordinary individuals don’t have. Regular taxpayers may see their personal incomes spike and plummet over several years, but are not allowed to carry forward a bad year against future taxes, let alone 18 years. Another example of the two-tier tax system is how small businesses are forced to compete with the rampant use by transnational companies of the offshore tax system. 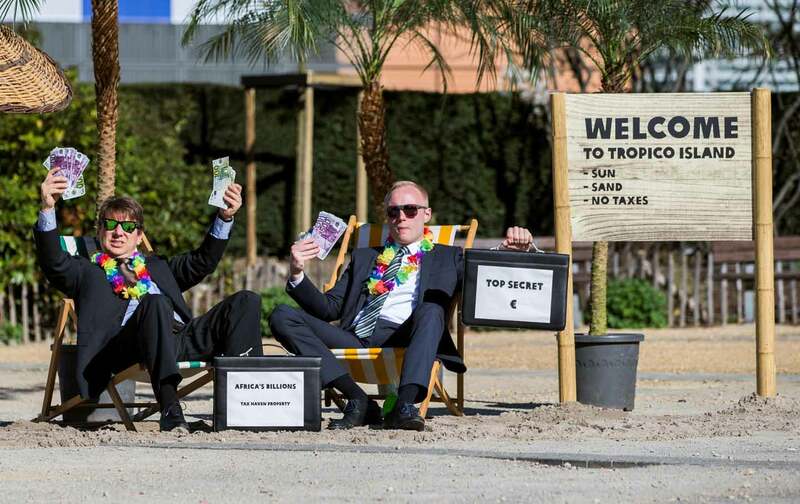 At least 367 of the Fortune 500 corporations operate at least 10,366 subsidiaries in tax-haven countries, including the Netherlands, Bermuda, and the Cayman Islands. These corporations are holding offshore an estimated $2.5 trillion in accumulated profits, according to a new study, “Offshore Shell Games,” authored by US PIRG and the Citizens for Tax Justice. Profitable American companies using this offshore system include Apple, Citigroup, Nike, Pfizer, PepsiCo, and Goldman Sachs. If these and other companies in the study brought their profits home and paid their fair share of corporate income taxes, they would owe $717.8 billion in federal taxes. Wealthy individuals also use the offshore system alongside complicated trusts and loopholes to minimize and dodge taxes. Tax-haven use by individuals has grown 25 percent in the last five years, according to researcher Gabriel Zucman, author of The Hidden Wealth of Nations: The Scourge of Tax Havens. Zucman estimates that about 8 percent of the world’s individual assets, an estimated $7.6 trillion are stashed in tax havens, including $1.2 trillion by US citizens. The United States loses an estimated $200 billion in lost revenue from individuals and $130 billion in corporate tax avoidance. Loopholes established to subvert the federal estate and gift tax, which is paid exclusively by multimillionaires and billionaires, enable wealthy families to place hundreds of billions a year beyond the reach of taxation. Sheldon Adelson, the Las Vegas casino mogul and GOP mega-donor, used a complex trust system called a Granter Retained Annuity Trust (GRAT) to pass on an estimated $8 billion to his children and dodge over $2.3 billion in estate taxes. We must shut down the offshore tax haven system, using American leadership to require transparency and reporting. During the first four years of the Obama administration, the wealthiest 0.01 percent of households saw their tax rate drop from an average 20.9 percent to 17.6 percent, despite no change during that time in the tax rate set by Congress. Creative accounting enabled these millionaires and billionaires to drop their effective tax rate to half the top marginal rate at the time, 35 percent. This fall is the 30th anniversary of the 1986 tax reform, dramatically chronicled in the book Showdown at Gucci Gulch. In that year, Congress undertook a massive tax-reform process that shut down thousands of tax loopholes and lowered tax rates while maintaining the same levels of revenue. Today it is hard to imagine that ultra-wealthy individuals like Trump or the most profitable corporations that dominate our political system would have any interest in meaningful tax reform. The present tax rules, complete with complexity and opaqueness, are their creation and serve their interests. Tax reform must be central to any progressive populist platform. We must shut down the offshore tax-haven system, using American global market leadership to require greater transparency and reporting. And we should raise standards in states such as Delaware and Wyoming that serve as internal US tax havens. It is easier to incorporate a shell corporation in these states than to get a fishing license or library card. Corporations that want to do business in the United States should be required to disclose the human beings that actually own and benefit from the corporation. We should eliminate the trusts and loopholes that render the tax system voluntary for billionaires. If we tax income from wages and capital gains at the same rates, we eliminate a plethora of tax shenanigans, such as the carried-interest loophole used primary by hedge-fund managers.